Two academics from the School of Pharmacy at the University of Wolverhampton travelled to Norway recently with a view to improving services in community pharmacy in the future. 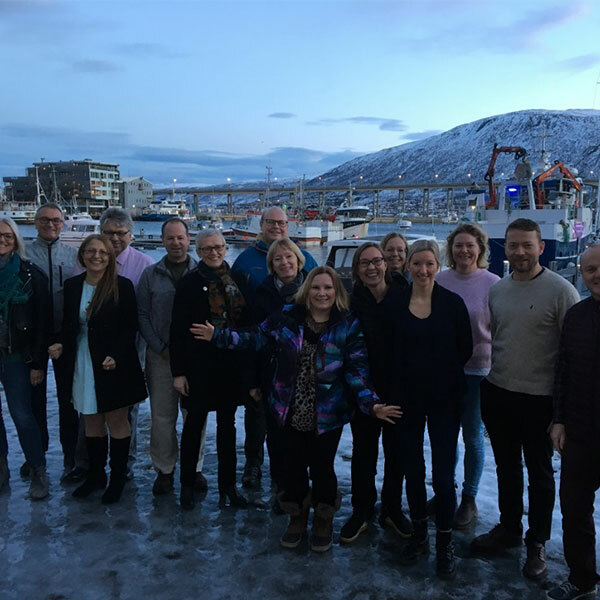 Dr Hana Morrissey and Professor Patrick Ball travelled to Tromso to put plans in place for a large-scale international project validating the benefits of new services in community pharmacy and comparing the outcomes across a range of countries. The academics have been working on the project, which is being co-ordinated by the University of Tromso, for two years. It includes collaborators from Norway, Sweden, United Kingdom, Denmark, Netherlands, the Republic of Ireland, USA and Australia. In addition to the University of Wolverhampton, the UK contingent includes Professor Michael Scott’s Medicines Optimization and Innovation Centre in Antrim Northern Ireland. Dr Morissey, Reader in Pharmacy at the University, said: “We are working closely with a very strong international team of successful researchers. Following this, Dr Morrissey (Reader) and Professor Ball, supported by the Project Support Office, submitted an application for a Horizon 2020 grant to sustain the next stage of the project. The team will next meet in March in Copenhagen to plan for another grant application to the Norwegian government. Anyone interested in studying Pharmacy at the University should register for our next Open Day on Saturday 2nd February 2019.